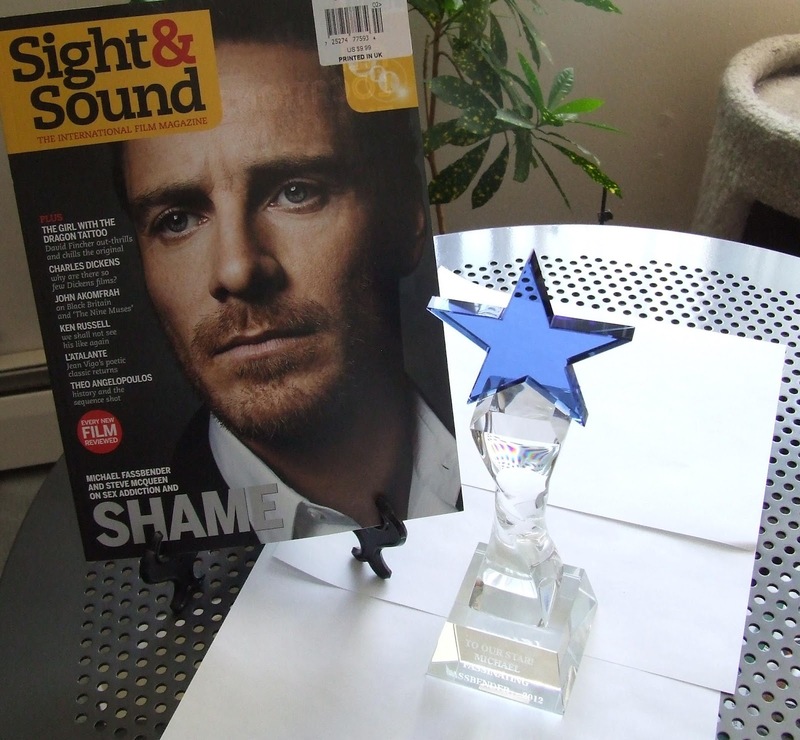 The 'Our Star' award is next to Michael's Sight & Sound magazine cover for scale. Today is Michael Fassbender's 35th birthday, and above is a picture of the crystal award that Fassinating Fassbender referred to as Plan B. Since September of last year, Michael has received nearly a dozen awards from the entertainment industry to celebrate his work in Shame. And a few of those honors recognized all his work in 2011 (Jane Eyre, X-Men: First Class, Shame, and A Dangerous Method). His family, friends, and management team were happy and proud of him and they were able to let him know first hand. But what about his fans, how could we let him know how proud we are of him, and to recognize his achievements by us? Sure, we have posted congratulations all over the Internet and various fan sites and tweets. But that’s just it… digital characters and images on a computer screen. We had nothing tangible to express how much we value his achievements and appreciate the many ways he entertained us throughout 2011. Crown Awards did a great job. The box was blue and sturdy, and had a blue satin lining to protect the award. A few days before the Oscar nominations in late January, I prepared myself for AMPAS to snub Michael, and I thought that if they could not at least honor the man with a nomination, then Fassinating Fassbender would step up and do something from the fans to honor him. As fate would have it, Michael did not get a nomination, and that disappointment gave birth to Plan B. This is just a beautiful award, easy to hold, and light but solid. So when I first announced Plan B on January 26th, I needed some people to join me on this project to help finance it. Due to a lot of interest, I had to close it after I got a dozen people. 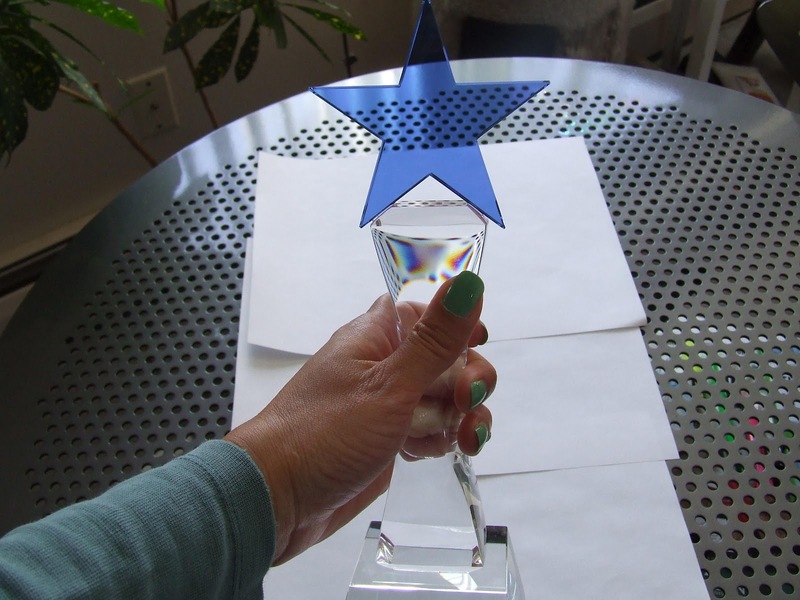 I also needed a group large enough to raise enough monies to buy the award and cover shipping. But I needed a group small enough to make it more manageable so that decisions can be made easier and with efficiency. 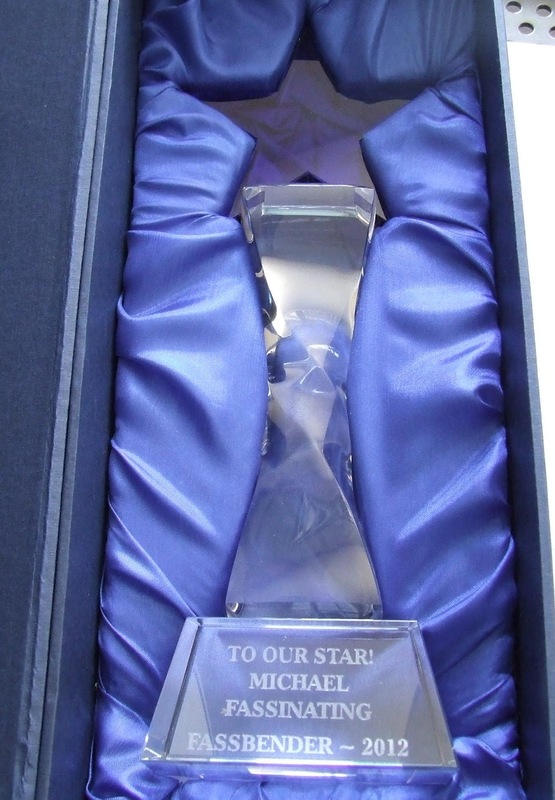 At my job, I work close with event planning staff and they always order brilliant crystal awards for a lot of doctors and researchers. I reviewed an older catalog from Crown Awards and immediately saw some beautiful awards that I thought would be good for our project. I brought to the Plan B group's attention several awards I really liked and gave them the online link to review other awards that caught their fancy. We eventually had a poll to decide between three awards, and we selected the 'Starfire'. We liked the Star on the top because it represents a Celebrity Star at the top of his game, which Michael is. I then estimated the cost of shipping and everyone donated their money. I ordered the award and it was delivered to me within 3 days. For the three weeks it was at my home, I only handled it twice. The first time was to inspect it upon delivery, and take pictures to show to the Plan B group, and the second time to clean it before I shipped it off. Being a part of Plan B allowed each person to hand write and mail to me a message to Michael to be included in a mini-photo album. 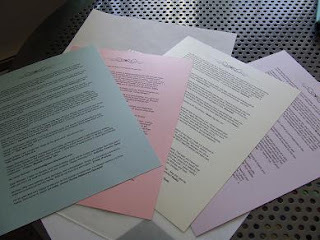 And around this same time in early March, I posted on FF inviting readers to email to me their birthday greetings and personal messages to Michael to be included in the Plan B package. I received 55 emails and it was my pleasure to add those messages onto pretty spring colored stationery. A few had to be edited for length, clarity, and spell checking, but overall, the messages were all lovely. I was moved by some of them, and I'm sure Michael will appreciate what everyone had to say. Fifty-five messages from around the world. I placed the award box, the mini-photo album, and messages in the same box that the award came in. I included a few thank you gifts to the nice Troika people for their kind help in ensuring Michael received the package in a timely matter. Hey, you gotta take care of people who take care of you. 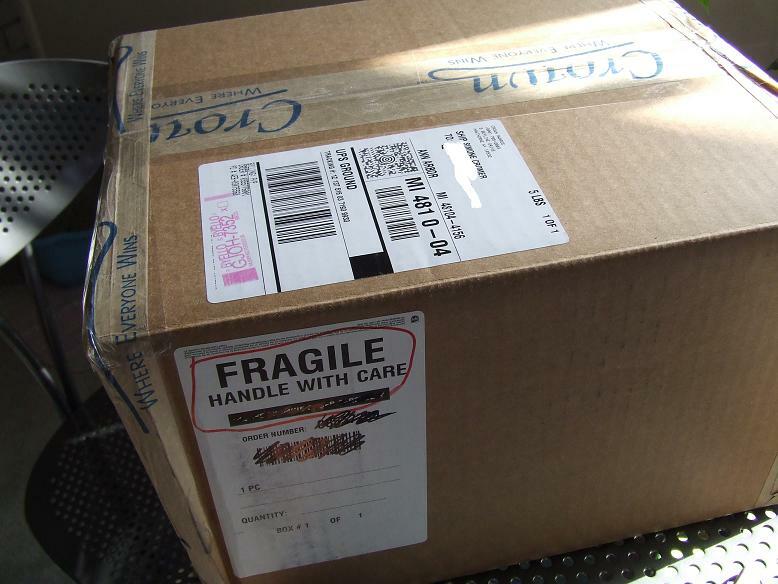 In total, the box weighed less than 7 lbs and all the long, I knew this package had to be sent via 2-day International Shipping due to the fragile contents, the tracking ability, and time frame. There were some nervous moments in the delivery of the package via FedEx, but in the end, it got to Troika on March 22nd, and Michael got it the following week when he came back home. Inside this envelope, which was enclosed in the award box, was a 'Congratulations' letter marking the reason for Michael being given this award. Troika emailed me last Thursday to let me know that Michael received it and was very surprised and moved by the award. He thanks everyone who contributed to the award, and sent in birthday greetings. I have a knack for gifting and packaging, so I made sure that the presentation of everyone's messages were designed in a fashion that was classy and well maintained to entice the recipient to thoroughly look at the gift. So if you submitted a birthday greeting, please know that Michael has read it. Troika along with Michael were very surprised at the expense of the shipping, and conveyed Michael's concern that people's hard earned money was going towards the shipment of such a gift. As much as I appreciate Michael's concern, it says so much about his lovely character to care about whatever financial burden this project may have caused us (there was none - all gave willingly and had the ability). It was suggested that perhaps in future celebrations of Michael's birthday, that we could donate to a charity. I will certainly consider that in the future, but in regards to Plan B, this was a one time special FF project and the method of shipping was our only option. So it's all good. From Ann Arbor to London in two days! I'd like to take a moment to thank the dozen people who helped with donating monies to Plan B. I would not and could not have done this without anyone else's help. Fassinating Fassbender is about US, not me. Admiring from afar, the career of a fantastic actor is more fun when you have like minded people to share in the enjoyment of things Fassy. Thanks to everyone who emailed me their personal messages and trusted me to include them in this special project. 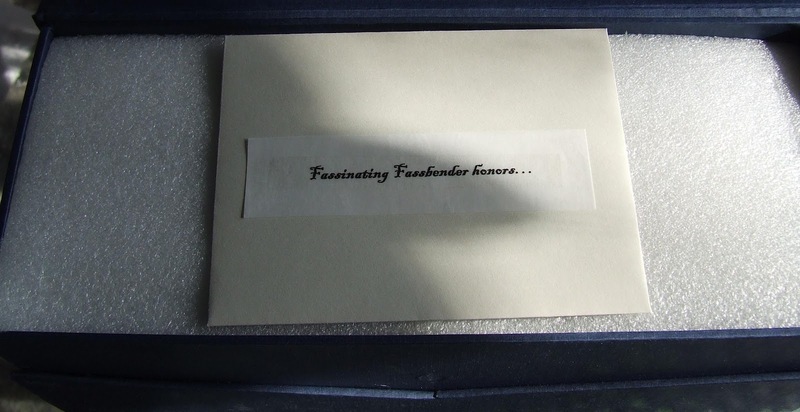 And to those of you who did not participate, that's ok; if you visit and support Fassinating Fassbender on a regular basis, that means you like Michael and you at least enjoy coming here, and therefore, I'm sure you will take pride in knowing that this award is from you too! This award is something tangible from Fassinating Fassbender that Michael is in awe of receiving, and it is the first award from his fans and it will sit next to his industry honors. Each award Michael has, he knows where it is from, and when he looks at ours, he'll think of us and know that we got his back and support him for many years to come. As fun and thrilling as it was organizing Plan B, I highly doubt we can top this and therefore, I don't think we'll do something on this scale again. But I do look forward to hearing from you all what you would like to do in the future regarding adopting a charity organization to support in Michael's name, or something more low keyed but still super cool. Exclusively here at Fassinating Fassbender, we're going to celebrate Fassy History Month! I would like to post a new poll weekly all this month, and post factoids about Mr. Fassbender. Maybe I'll create a quiz, but I don't have any prizes... hmmm. I'll think of something. I have a full class load for the rest of the month as this term comes to a close, so I will get jittery with studies and need something fun to do for a few moments to break the monotony of studying. Again, thanks for your patience and support for Plan B, I KNOW many of you were just anxious as heck to know what it was, and so now you do! Hope you like it. Hi Simone! it s a destiny im finally at home and it s on bday our fassy! great plan B! and im so happy that i wany (specially today) everyone (no amtter fassinator or not) will be happy like no one in universe. You (and the other plan B team members) did a grat job! I want to say THANKS! Omg! The gift and the award are awesome Simone!! Thank you so much! I'm very proud to be a part of this project and i'm sure that Michael will be very proud of us. I want to thank all of you for this exclusive gift! and happy happy birthday Michael! I hope that you'll have a great one! Simone, you did a great job!! Your plan B was really an inspiration! Keep up the good work and many thanks for keeping us posted!OH,OH and.. HAPPY BIRTHDAY MICHAEL!!!!!!!!! Oh well, HAPPY BIRTHDAY FASSY!!!!! 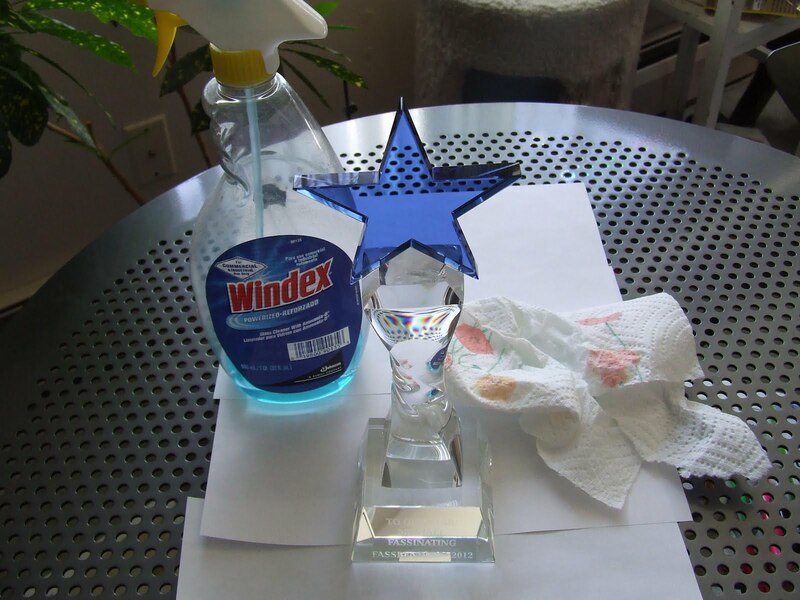 The award and presentation were exactly as I expected. It was nice to know Michael was moved by the gift. Thanks again Simone for this WONDERFUL organization & this amazing idea !!!! I'm so happy to see that Michael received pack of Plan B.
I'm thankful to you. And I'm so glad to be a one of Fassinators! This award looks amazing, really great to have done Simone, at the beginning as I saw the picture I thought he got a reward from the magazine, and here a surprise, I'm sure Michael was very happy with the gift. As Lil Jon says YEAH!!!! This so awesome. Fassy Happy Birthday and enjoy. can't wait for Prometheus and you's be working with him again. Oh honey that is awesome. Chuuch!! Cheers! Dear Simone, thank you for Plan B! Everything just looks wonderful. What a great team effort with an awesome leader! :-) Thanks Simone, thanks to the Plan B team, thanks to the Fassinators, and most importantly, thanks to Michael! That's a beautiful and thoughtful gift! I'm glad I decided to submit a birthday greeting to go along with it. This is s neat, I'm happy Fass was overwhelmed. He really cares about his fans, and he knows we appreciate him! I think one of the greatest gifts of being involved with the project was how Fassinators are making new friends all over the world. It’s great to be united over something! I agree Simone and Veronica! It's nice to meet other Fassinators from all over. That's so incredibly sweet of you guys! I'm so pleased that Michael liked the gift, he knows that his fans greatly appreciate him!!! I wish I could have gotten in on the fun but you guys did a great job! ^Thank you Anon! We greatly appreciate the support of fellow fans like yourself! Hi Jesse! I'm sorry it's so hard for people to find us, thanks to the discriminatory policies of Google Alert, but you found us now. It's great to know that you think highly of Plan B. Thanks so much for your support, and welcome to Fassinating Fassbender!